Feeling horny and I don't like it- How we dehorn dairy cows. I am talking about horns on dairy calves folks! Get your head out of the gutter! It’s time to talk about how we dehorn dairy cows. This is not a dairy cow. Thank God. I would hate to have to work around those things! Horns. You know those things rodeo bulls have? The Texas Longhorns have them too. So do most dairy cattle, even the girls. Horns on cows are not like horns on deer. Both male and female cattle grow them. Despite the cow toy industries seeming need to place horns on every stuffed Holstein, I bet most people have never seen a dairy cow that has horns…. 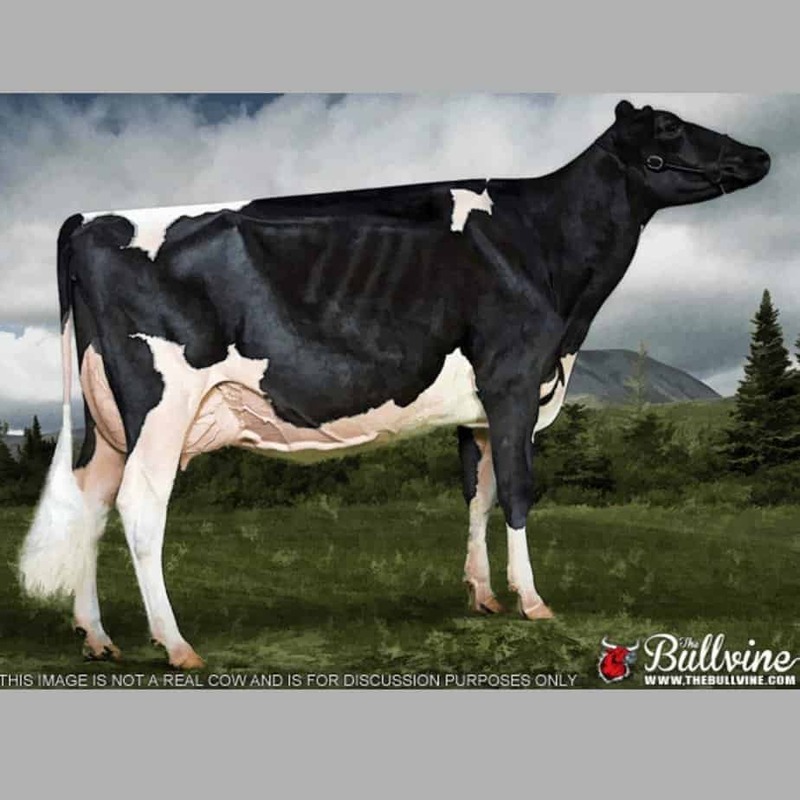 Of course I am reminded everyday that most people have never seen a dairy cow…. with or without horns. This is what comes up on a google image search for stuffed cow. I added the red X on all the dairy animals that are also sporting horns. I am not sure why the stuffed toy industry insists on putting horns on dairy cows. While it may be anatomically correct, I promise you can’t tell if the stuffed animals are bulls or heifers! I hope I am not confusing you. Yes, I said that most dairy cows have horns naturally and I also said that it is very rare to see a dairy cow that has horns. How can this be? The simple answer is that dairy farmers dehorn dairy cows. Dehorning calves is one of the most hated jobs on our farm and I would be willing to bet that there isn’t a farmer out there that enjoys doing it. However it is a 100% necessary job on a dairy farm. Cows with horns are not only more dangerous for farmers to work around, they also are dangerous to each other and to facilities. Don’t believe me? Imagine this cow fight with horns. Not pretty. Pokey, pointy, hard things attached to 1500lbs animals does not work out well. This is why we dehorn dairy cows. Our goal is to make dehorning as low stress and as least painful as possible for our calves. We want our calves to be happy and healthy and to grow up to be happy healthy cows. 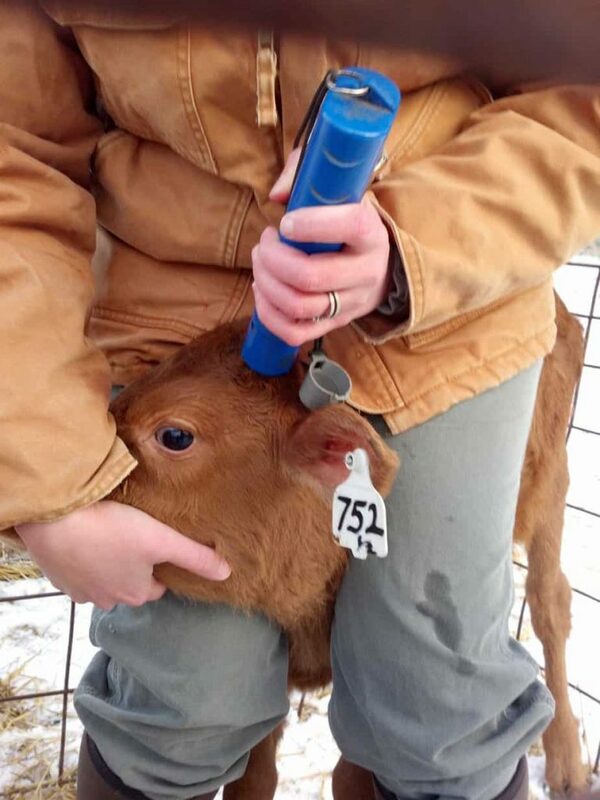 The tool we use to dehorn our calves uses heat to cauterize the blood flow to the horn so it doesn’t grow. What this means is that it gets really, really hot and you put the metal tip on the horn bud. 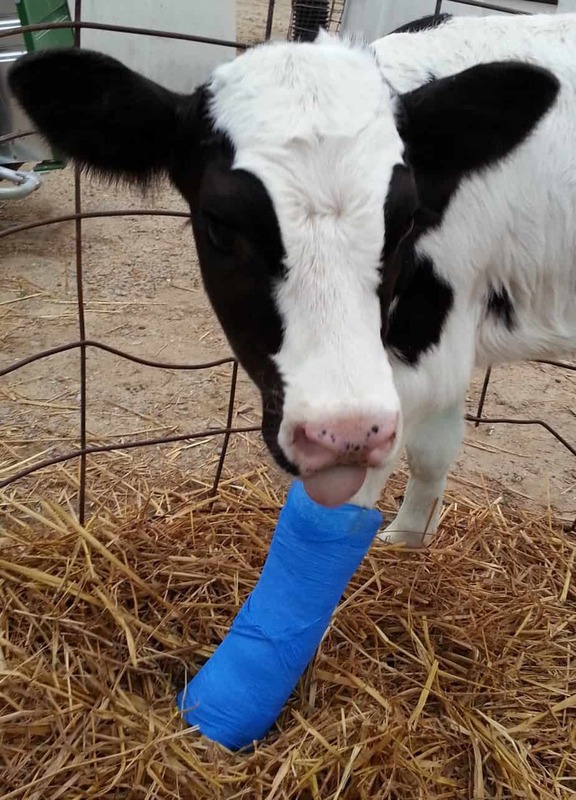 It doesn’t feel good for the calf. Which is why we numb the area ahead of time. I am sure a horn being used as a weapon against you wouldn’t feel good either. I believe this is the lesser pain. Right now we use a “Buddex” dehorner. I will soon be upgrading to a butane dehorner because I believe that it will do a faster cauterization and be less painful to my calves. Farmers are always looking for the best way to do things for their animals. After being dehorned Penny was pretty mad at me, but she was still healthy and I bet by tomorrow she will have forgotten why she was mad. 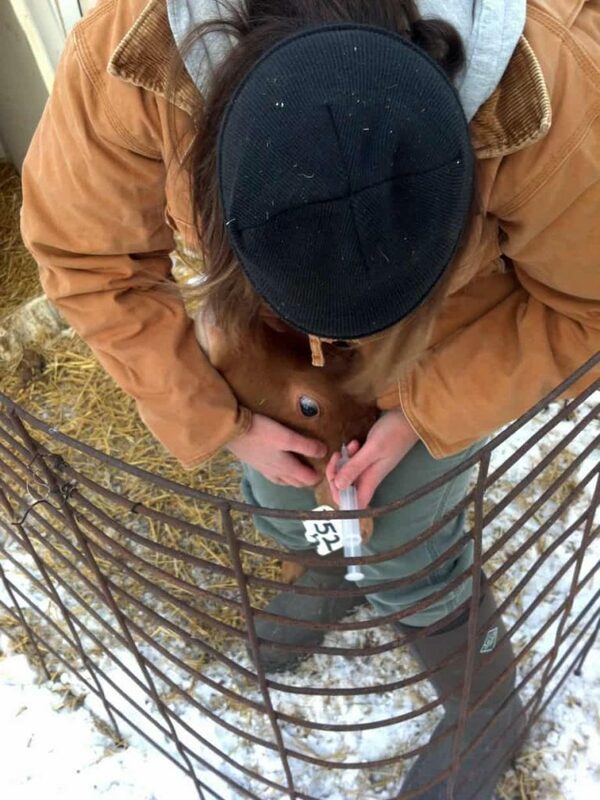 After being dehorned I watch my calves extra careful and give them extra love. The horn bud will develop a scab and as it heals it will get itchy. I always try to give the calves a few extra scratches when I feed them when they get to this stage. They sure seem to appreciate it. I wish that dehorning didn’t have to happen and we are making big steps in the dairy industry to phase the needs out. Polled genes are making a big difference! Right now more and more attention is being paid to using “Polled Genetics” on farms. A “polled” animal is an animal that is missing the gene that tells the calf to grow horns. Farmers can now include polled genetics in the list of attributes they look for in a bull. 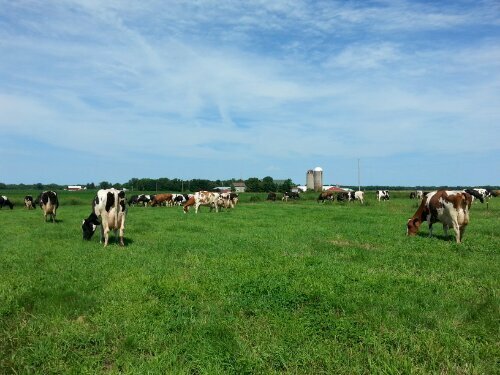 It takes time to build a 100% polled herd but farms are getting closer all the time. I know I am looking forward to the day I can cross this job off the list forever. 16 Comments on Feeling horny and I don’t like it- How we dehorn dairy cows. Great Blog Carrie. Catchy title! You bring both sides to the issue. The selection of Polled Genetics is improving everyday. I thought about the title for awhile and decided to go with the tongue in cheek version. I am thankful that the polled gene pool is growing. I really believe that polled animals is the way of the future in dairy cattle. We tried the burning method but always had a problem with them growing back. We cut them still, yes the old method used by many years ago. Caccinate and dehorning is one of our biggest spring and fall jobs. So glad when we have that job done! We have always had really good luck with doing it this way. I know everyone has their own way to do this, just like no two farmers are alike in their ways of farming. We are also very excited to find the polled ones that get slipped in there! I would love it if there were more polled!!! Although I do kind of like the looks of a Texas Longhorn I do not think I would be able to handle them, but they sure are kind of neat looking! Great informative post! I had a hard time finding this post all I had was the link for #Non Dairy Carrie. I am glad to see more educating coming from you. You are definately an #Agvocate! My husbands family has had a dairy farm for more than 50 years. Every single one of our dairy herd (Holsteins) have their horns. We have never had a serious injury to a family member or herd member due to their horns. We have had to trim a horn here and there due to a dangerous growth pattern but other than that they all have their natural horns. Thanks for sharing Robin. I am very glad that your husband’s family has been fortunate enough to not have any major injuries. However I do believe that their farm would be the exception to the rule. Thanks so much for answering that question for me. I have always had this “want” to learn more about farming, and although my family years ago were farmers, I am long removed from it. The American Farmer is my “hero”..hard, dangerous work and when crops fail it can be the end for some. I did have a “eye opening” experience at a large commerical dairy farm with thousands of Holsteins. Cows milked on a carousal and calves being born in front of me. Keep your comments posted so we all can -learn more-. Thanks for reading and commenting! I will continue to share life on our farm and try to answer any questions I can.